The Border Collie Inquisitor is keen to share your stories, photos, insights, and humor. True Stories. We love purposefully crafted stories that feature individual dogs, especially Border Collies and other herding breeds. We’re all about real-life canine characters! Limit 50 to 500 words. Include 1 to 3 photos. Photos. We want photos of dogs, especially Border Collies and other herding breeds that capture individual personality and breed uniqueness. Who doesn’t love a cool dog picture? We need a good, clear photo, a byline, and a caption. You may also add up to 100 words to explain the situation. Essays. We’re eager to learn more about how to rescue, breed, raise, train, and play with our Border Collies and other herding dogs. 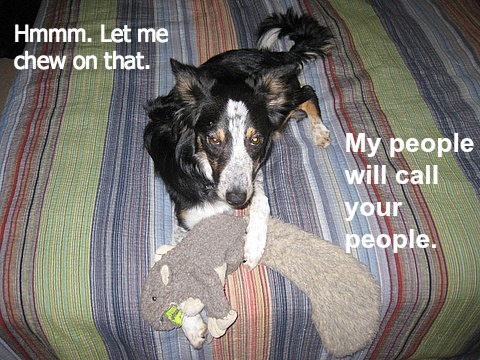 Border Collies are smart, and so are their people. If you’re facing down a subject like canine behavior, genetics, neuroscience, or evolutionary biology, we’re with you. Please narrow your focus to one specific topic. For example, instead of “training” or “heeling,” try, “how to stop an eager Border Collie from forging.” If you’re worrying a bone about the differences between herding breeds and wolves, you might narrow it to your thoughts on Adam Miklosi’s pointing experiment. Limit each essay to 50 to 500 words or to a series of short, interrelated essays. Include 1 to 3 photos to illustrate (per post). Suggestions. Got an idea but you’re unsure how to write it? Maybe we can help! Toss us a suggestion, and if we like it, we’ll run with it! Queries. Want to write something for us, but you’re not sure we can use it? Just ask! Pitch us the idea. Maybe we can negotiate. We’re pack animals. We work together. Submit your photos, stories, essays, suggestions, and queries to bordercollieinquisitor@gmail.com. Send photos as attachments. Send all text in the body of the email.